Minneapolis, Minnesota: Angel Bomb Design, 2012. Standard edition of 250; deluxe edition of 35. 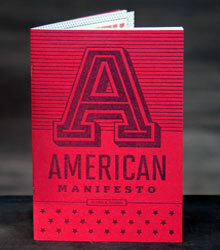 Standard edition: 10.5 x 7.5"; 12 pages.Printed letterpress in three colors on 100% cotton Crane Lettra. Handprinted on a Vandercook 219 proof press. Handbound pamphlet stitch binding. Signed and numbered by the artist. Deluxe edition: 11 x 7.75"; 20 pages. Printed on 100% cotton Crane Lettra. Letterpress printed in three colors. Futura Book, Headliner No. 45, and Bubbledot types. Bound in cloth-covered boards with handmade bamboo paper end sheets. Matching slipcase with blind deboss illustration. Signed and numbered by the artist on the colophon. Includes suite of three extra prints relating to the story. Each print signed and dated by the artist. 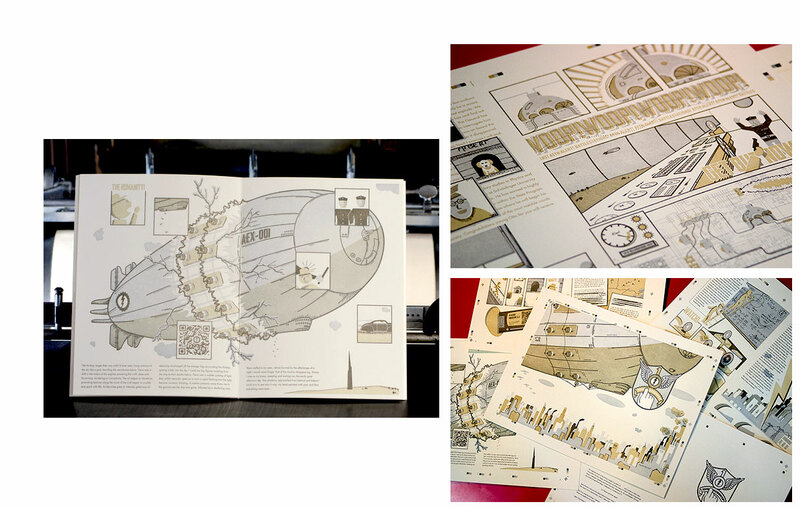 Todd M. Thyberg: "The Airship is a science fiction story and first in a trilogy of planned letterpress graphic novels. In it, I seek to draw a literary analogy between the dichotomy of using modern day digital design tools to create works that are produced on vintage analog equipment. In this story, set in a fictional past, one of the characters is transported to another dimension in space and time. His attempts to communicate across this gulf are indecipherable to the reader without access to a smartphone. I hope to entice readers into seeing new possibilities for tying two disparate mediums together for a more interactive and unique experience. 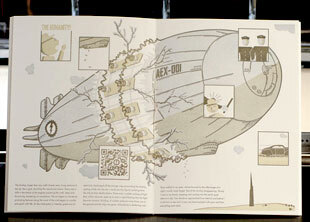 Readers must use their smartphone to scan QR codes so they can see video messages and explore The Airship." Minneapolis, Minnesota: Angel Bomb Design, 2012. Edition of 250. 5.75 x 8.5"; 12 pages. Letterpress printed in three colors on a Heidelberg 10x15 Windmill. Printed on 100% cotton Crane Lettra Pearl White in Solano, Gotham, and Kaine typefaces. Saddle stitch bound in Condenons So. Wool Red Tartan paper wraps. Todd M. Thyberg: "With a tip of the hat to printers and activists of the past, American Manifesto calls the United States citizens to action on a number of national concerns—our country’s health, leadership, and environment, to name a few." Back Cover: "If America really is the best country on earth…why do so many of our people go hungry? Why do our leaders consistently work for corporate interests rather than individuals’ rights? How can our leaders, the media, and we the public still be ignorant to the factual reality of climate change? Why can someone go to prison for a minor drug offense while the people who brought our economy to its knees still receive bonuses? Why are we still taking off our shoes to fly? How can 2/3 of America’s population be overweight when people here and around the world are going hungry? How is it acceptable to make fuel from food? Why don’t we Americans question policies?"